The Christmas Gift List Workbook is a great way to organize and manage both your budget and your holiday shopping this year. The easily customizable template has a table for every person you want to buy a gift. By separating your gift recipients into sections, this gives you the opportunity to analyze a clear overview of all your holiday shopping. The budget template also includes a display table of all your calculated totals, so you know you’re going to stay on budget. Now, you have the time to buy the best gifts for the people you love, simply download the Christmas Gift template for free today! To get started, you’ll need to download the free file below by clicking on the link provided! Remember, you can change any of the pre-written text by highlighting the text and typing your new information. The next step for customizing your document is changing the titles for individuals or groups throughout the document. This should be people that need to buy gifts. You can also list a group of people, such as coworkers, so you make sure no one is forgotten. Once you have all the names listed, you can begin to enter specific items in each of the rows under your gift recipient. Each table will give you a total amount for the person or groups you entered a gift under. Notice that once you have all your tables filled out, the template will calculate all the totals in the main overview in the top left-hand corner of the page. It even provides a breakdown of each group of people. Now you have a way to keep track of your holiday spending and you can rein in the savings this year! 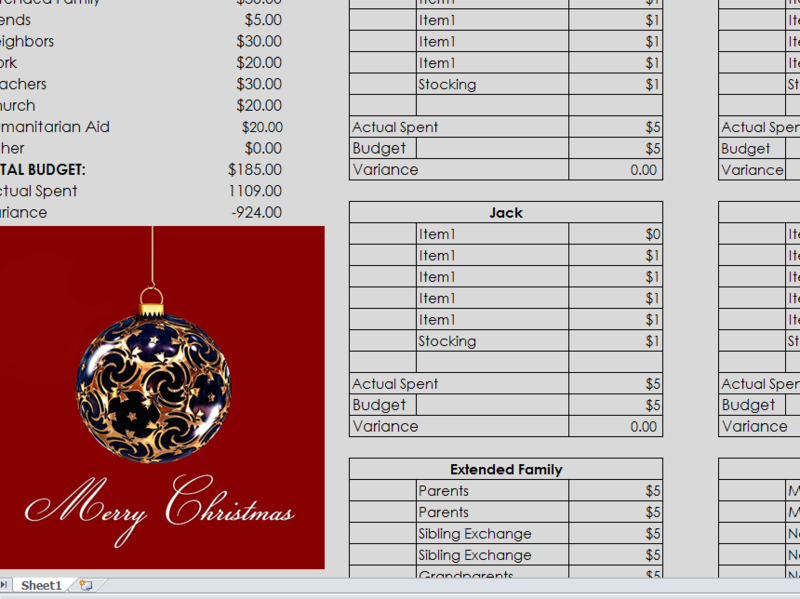 By using this template, you will gain a firm understanding of where your money is going this holiday season. Nothing is better than having peace of mind during this stressful holiday season, but you can make life much easier by documenting your expenses and having complete control over your holiday spending! Create your own holiday budget this season!